April 4, 2017, 4:20 AM · My wife, Tanya, and I spent our first years together playing in large symphony orchestras. In some cases with over a hundred musicians on the stage--- the vast majority of which were not violas--- it was a struggle to be heard. We liked the music though. 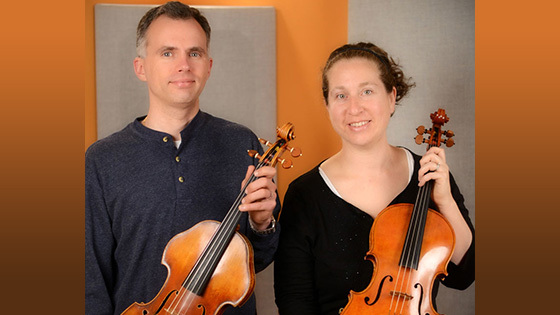 It occurred to us that perhaps the essence of some of the great masterworks of that repertoire might be retained while stripping away all non-essential, non-viola instruments from the stage. In this case, a section of 12 violas also seemed outsized as there was no longer an ongoing battle with the trombones. We felt two was a more appropriate number. With this new, leaner instrumentation, greater clarity is achieved, which in our opinion allows the true musical intentions of the composers to shine through. Call it a historically-informed reconstruction, if you will, as it's self-evident that truly great composers didn't intend to bury the beautiful sound of the viola under a cacophonous stew of brass, piccolo, and snare drum noises, better suited to a battlefield than a concert hall. Otherwise, why have them on stage at all? If Tchaikovsky meant for the cannons to cover up the sound of the viola section.... why were the violas on stage? Why would Wagner want four of the eight Valkyrie sisters to shout Hojotoho at the top of their lungs... if you couldn't also hear the violas? During our time in the orchestral world, we often asked ourselves these questions, and it became obvious that even the greatest of composers can sometimes misjudge balance in orchestration in this way. 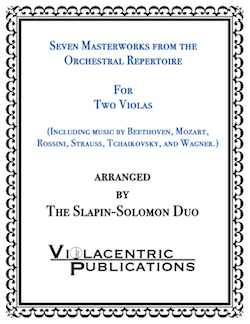 We're therefore proud to announce that our viola-duo arrangements are now available of some of the greatest orchestral masterpieces ever written: Wagner's Ride of the Valkyries, Tchaikovsky's 1812 Overture, Rossini's Overture to the Barber of Seville, J. Strauss' Overture to Fledermaus, Mozart's Overture to the Marriage of Figaro as well as two complete and unabridged four-movement symphonies: Beethoven's Fifth and Mozart's Jupiter. Here is a link to the sheet music. We hope you enjoy! April 4, 2017 at 05:44 PM · Amazingly beautiful! Thank you. April 4, 2017 at 06:03 PM · Sergiu Celibidache - Viola! April 4, 2017 at 08:30 PM · When Liszt claimed that all orchestral music could be performed in piano reduction Mendelssohn asked "The beginning of Mozart 40? ", at which Liszt admitted defeat. You two wouldn't need to - but surely there are orchestral passages that would defeat two violas? Perhaps the three part counterpoint from the Meistersinger Overture? April 6, 2017 at 11:53 AM · Very original, congratulations!